It all started with a 128 MB Micro SD card for mobiles. Where 128 MB Storage is considered to be enough for mobiles phones. Since at that time most of the phones are equipped with VGA camera or at max 1 MP camera. (Back in that time it was actually a huge deal for phone to be equipped with a camera). and very few multimedia features. So their storage requirements were also low. But as we know now a days some of the phones are equipped with 20 MP camera. (Even more for some phones). The storage requirement is also increased.These days the Smartphones requires huge Storage for pictures, apps, Games. ( Some of the graphic intensive games requires >2 GB of storage.). etc. That is why most of the smartphone (These Days.) are designed to Support 128 GB Micro SD cards. Coming back to the original topic of the post. i.e The 512 GB Micro SD card. It is manufactured by the company named Microdia. It is supposed to be the World’s First 512 GB Micro SD Card. Microdia 512 GB Micro SD card Features. The Microdia 512 GB Micro SD card features data transfer speed up to 300 mbps. Yes you read it right. Since its is a UHS. (Ulta High Speed.) which uses a SD 4.0. i.e it consists of some extra pins as compared to the standard Micro SD cards. ( As you can see in the image above). This makes it a ideal Storage medium for professional photographers. 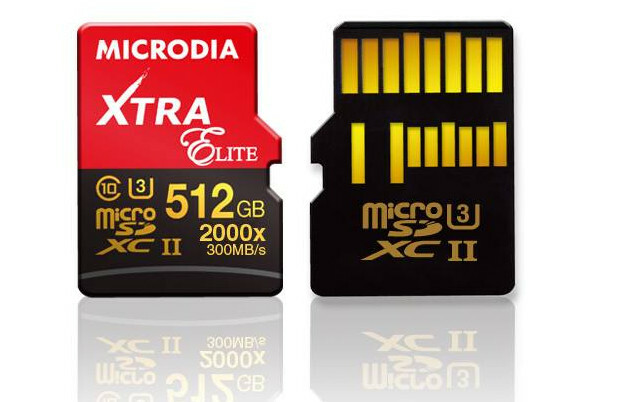 Microdia 512 GB Micro SD card Price-Launch Date. It is obvious that Huge Storage and Huge Speeds has its price. Its expected price is 1000$ i.e its Price in India will be around 63000 Rupees. ( this might not be the final retail price). It is expected to be launched in July. No News on the exact date though. But we will keep you updated. Will You Buy A 1000$ Micro SD card?